You almost made it through the first week of the year, don’t give up eat ice cream! Yes you heard me right and not just that pint in the freezer but Peppermint The Bomb Bomb Smoothie Cream! A smoothie bowl so thick I had to give it it’s own name. 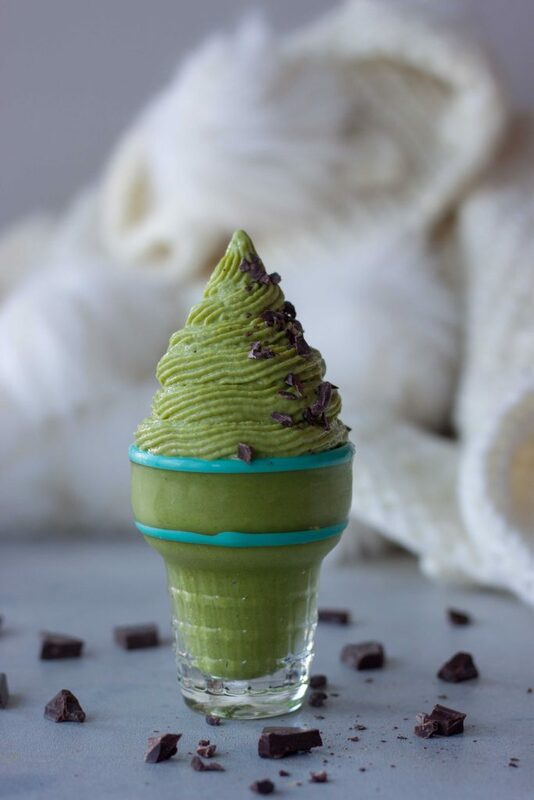 A healthy twist on Peppermint Bon Bon ice cream, that’s what it’s called here in Minnesota, but you might know it as Mint Chip. No I’m not trying a new eating plan and I haven’t cut sugar or carbs but I do love this Peppermint The Bomb Bomb Smoothie Cream. A little thinner and more soft serve as a smoothie bowl or thick like ice cream. I’ve recieved many messages over the last couple weeks from friends, family, and followers who are trying a new eating plan and wanting help and ideas. Some cutting out gluten or dairy, some trying a plant-based or vegan diet, some having to go low carb, and some just wanting to eat healthier. Some areas I can offer more help than others but I do what I can to help and inspire. We are not even a full week into the new year and I have already recieved messages that it’s not working or they are ready to throw in the towel. While I will always “preach” real food and nutrition over calories I want to help others when I can. So if one is looking to just cut calories I’m not going to suggestion 100 calorie packs of food or artificial foods but instead eating more veggies and looking for nutrient dense and filling foods. This is not only a recipe but a message of hope. Change doesn’t happen overnight and it will get easier. Trying something new might not be right for you but only you know that. If you aren’t feeling good then maybe it isn’t or maybe you need to change things a little or give it more time not just give up. Over the years I’ve had dietary restrictions and usually for medical reasons and the hardiest thing was cravings for old favorites that I could no longer had. Knowing what I know now I would have tried to look at things more positively and think of it as a chance to try new things and find alternatives but still I know it would have been hard. Not that I still wouldn’t have cried over cutting out gluten or dairy as I love my carbs and yogurt. Or even soy, crazy but this girl missed her tofu. Over the years things have changed and even when things change and I try to eat foods again or remove others I still use caution and try to balance things no overdoing it. It’s all about balance and find what works for you. 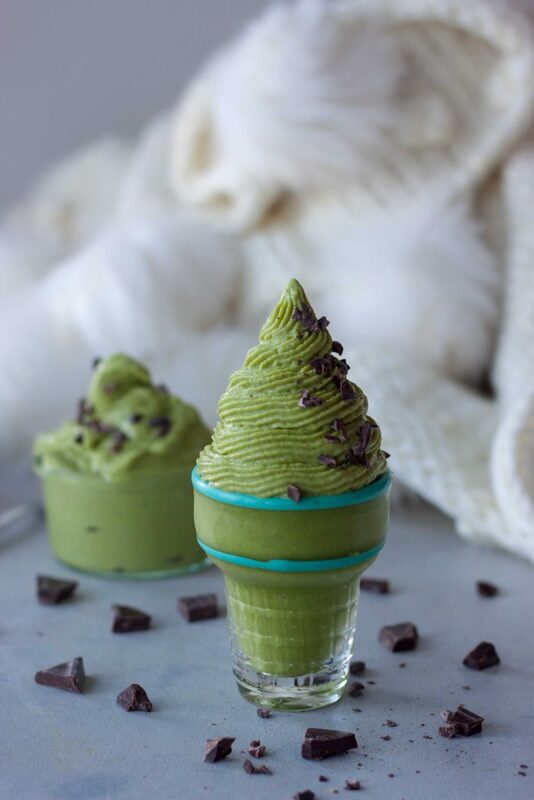 In the kitchen the last couple weeks I’ve been making variations of peppermint bon bon, or mint chip, smoothies and smoothie bowls like this one. Here is one of them I was shocked still turned out green I posted on Instagram. I like my smoothie bowls thick but sometimes I take it a little too far to the point of ice cream, oops! Not that I was complaining as I snuggle up in my blanket and enjoy it as the temps outside are sub zero. I got many comments and inquires about the smoothie bowl on Instagram and ones on Insta Stories and as I enjoyed one earlier this week I knew I had to share it and a few versions to inspire those wanting to give in and give up a week into the new year. 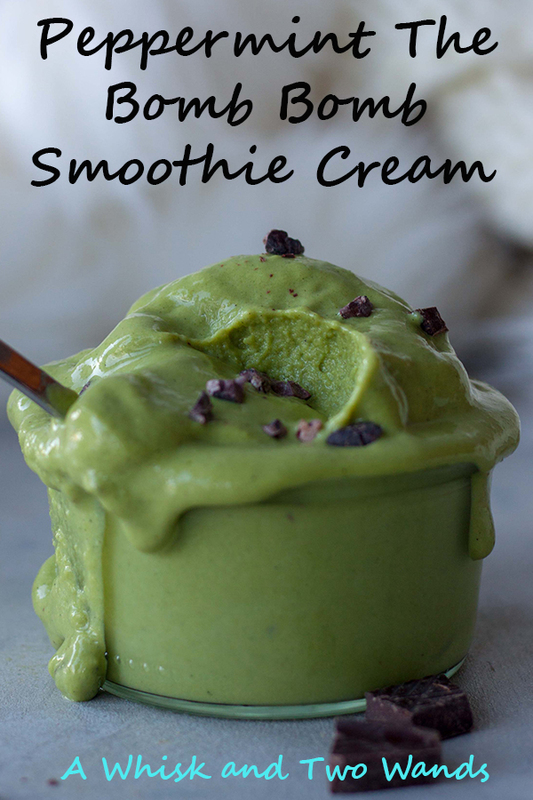 This Peppermint The Bomb Bomb Smoothie Cream is vegan, gluten free, dairy free, low sugar and low carb with a high fat and high protein options. I’m not an expert on paleo or Whole30 so I’m not sure if this would work for that or could be modified. If you are trying one of these and need a substitution for an ingredient let me know and I’ll try to help you. 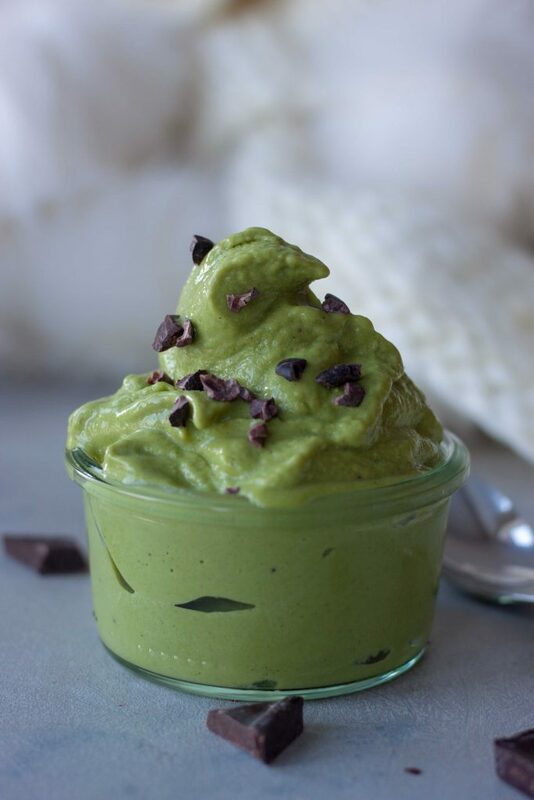 It’s packed with greens and depending on the protein powder used vitamins, minerals, enzymes, superfoods, and probiotics! Did I mention it’s delicious? It will keep you full and it is very satisfying. So yes I know there is cauliflower (which might having you saying oh heck no!) but trust me you don’t taste it, especially with the peppermint oil. If you don’t have peppermint oil you can sub peppermint extract just start slow as you don’t want it too overpowering. I got this peppermint oil from a friend a little over a year ago and love it. It’s calming yet energizing and I’ve heard it’s good for digestion. I don’t usually do nutritional information but I’m going to add the breakdown for a few variations below. The information is based on the recipe below being 1 serving although it can be broken into 2 smaller servings. Since I usually eat the full amount like I would a smoothie bowl post workout or a snack I calculated it out this way. Using alternate milk, protein, chocolate, or adding in adaptogens or collagen will vary results. For recipes like this I use an unsweetened low calorie non dairy milk. For protein reference both are vegan and gluten free and here are the stats for the ones I have. There are different benefits to both and reasons I love both and use them regularly and they are staples in my kitchen. Version 1 made with Unsweetened Almond Milk, 1 cup frozen cauliflower rice, 2c of Power Greens, 1 scoop Vanilla Vega Sport Protein, 1 tsp cacao nibs, 2 drops pure peppermint oil. Using a 1/4 Vega Maca Chocolate Bar instead of cacao nibs add 33 calories, 2 grams of fat, 3.25 grams carbs, 1 gram fiber, 2 grams sugar. Version 2 made with Unsweetened Almond Milk, 1 cup frozen cauliflower rice, 2 cups of Power Greens, 2 scoops Vanilla & Greens Navitas Organics Essential Blend, 1 tsp cacao nibs, 2 drops pure peppermint oil. Version 3 made with Unsweetened Almond Milk, 1 cup frozen cauliflower rice, 2 cups of Power Greens, 1/2 ripe avocado, 1 tsp cacao nibs, 2 drops pure peppermint oil. 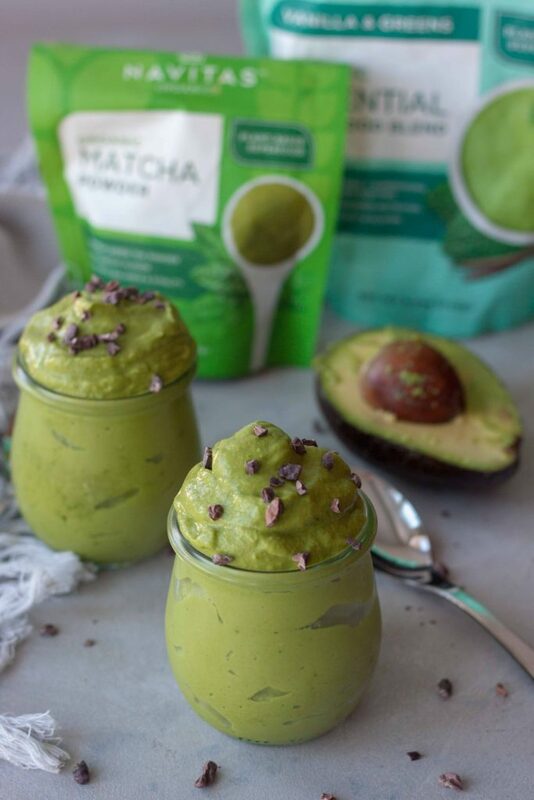 Adding 1/2 tsp matcha powder adds 5 calories and 1 carb. If wanting to add protein and use avocado and not use protein powder you can use Ripple Unsweetened Plant Protein Milk, it will have 50 more calories I believe per cup then the average 30 calories of unsweetened almond milk I used in the above calculations. If you are enjoying this as a snack and dividing it into 2 servings it probably won’t be a big deal in your macros if you are calculating them. Remember to still try to enjoy life and try to find the positive. If you aren’t happy you aren’t going to stick with any change and it will start to affect other areas of your life. When it comes to workouts yes switch things up, try new things, but if you have fun doing it you’re going to want to do it and stick with it and in the end that energy will push you. If recipes like this help you or there are other questions or things I can help you with leave a comment below or send me a message and I will do my best to help. I’m not an nutritionist, dietician, or doctor but I do my research, love food, and like to help and inspire others to live their best life. If I can’t help you I will try to point you to someone who can. For instance I’m not an expert with Whole30 or paleo but I have fellow food bloggers that are very knowledgeable in this area. I can also recommend people to follow over on Instagram for inspiration for gluten free, paleo, dairy free, fitness, ect. So go ahead and celebrate making it through the first week of the new year with some Peppermint The Bomb Bomb Smoothie Cream! 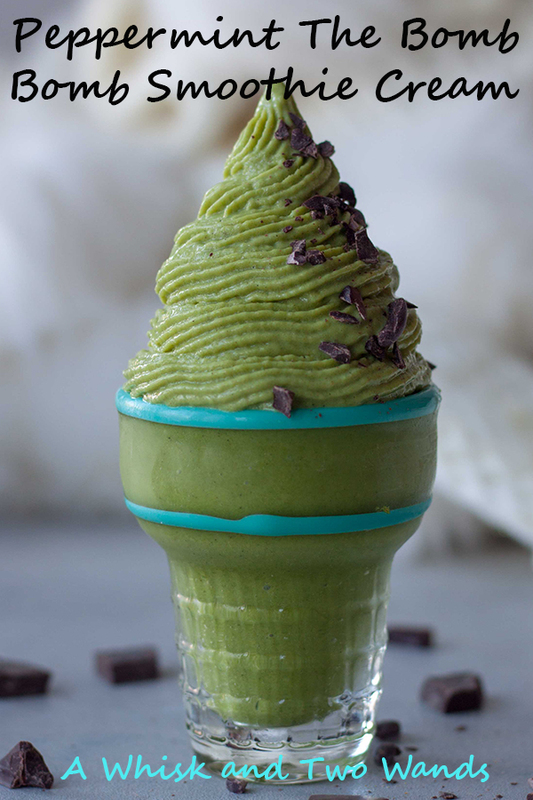 Hey green smoothies are healthy and good for you, especially this one in “ice cream” form! 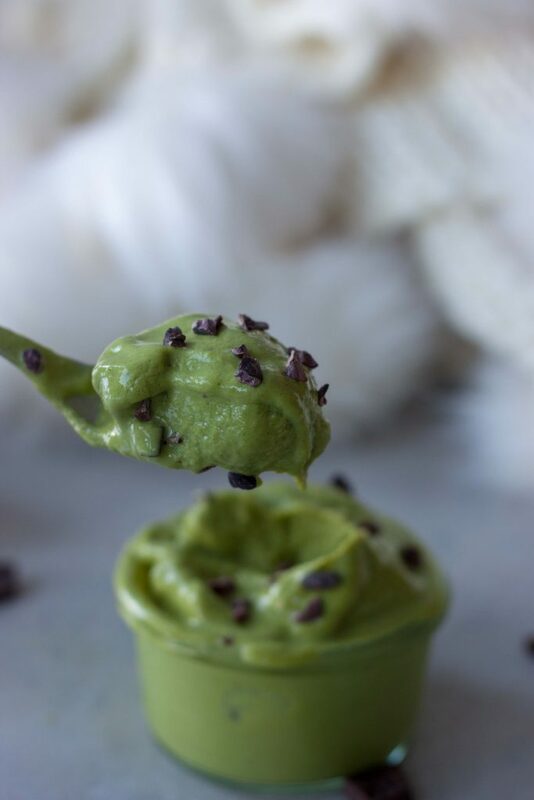 Peppermint The Bomb Bomb Smoothie Cream, a green smoothie in healthy ice cream form that is vegan, gluten free, low sugar, low carb, and delicious! High fat versions using avocado, high protein versions, as well as many optional healthy benefit add-ins. 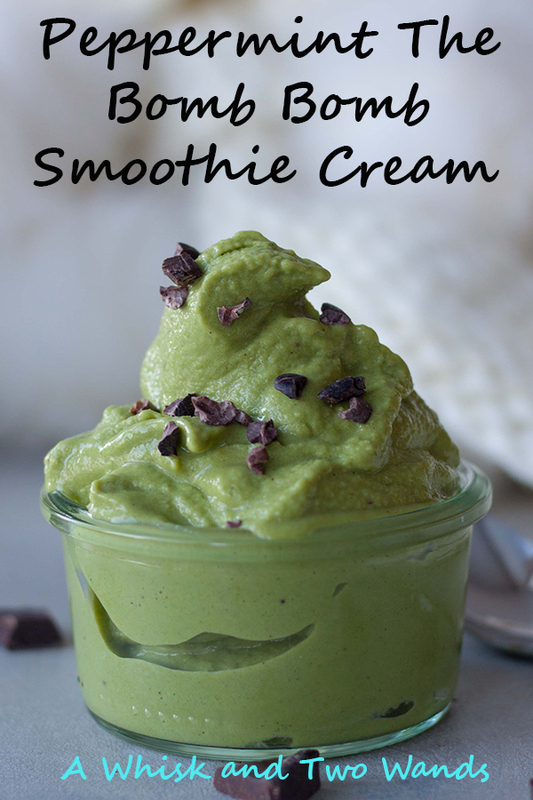 In a Vitamix, or high-speed blender, blend together milk, protein powder, peppermint oil, and greens until smooth. If adding matcha or any additional powders or adaptogens also add them now. This is so you don't have pieces of green and can get the thickest smoothest consistency. If making with avocado add that now. Starting with 3/4 of a cup add cauliflower and use tamping tool if needed if you want to make it really thick. Add additional cauliflower to reach desired consistency. Once it is just smooth pulse in cacao nibs/chocolate or sprinkle on top, or you can do both. When you aren't able to use your avocados because they all get ripe at the same time cut them in half or quarters and freeze them. This recipe would be a good use for frozen avocados. With both spinach and cauliflower this is really a salad right?! I am all in! I was thinking a green smoothie but I like the way you think!